RadHubTile is the most commonly used tile. It consists of an icon and a title, a notification and a message beside it. Message (object): Gets or sets the message content that is displayed in the top-left corner of the control. MessageTemplate (DataTemplate): Gets or sets the DataTemplate that is used to visualize the Message property. 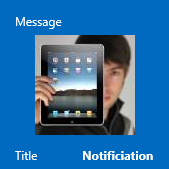 Notification (object): Gets or sets the additional information (notification) displayed on the tile. Typically this may be the Message Count and is displayed in the bottom-right corner of the control. NotificationTemplate (DataTemplate): Gets or sets the DataTemplate that is used to visualize the Notification property. ImageSource (ImageSource): Gets or sets the source of the tile image. The following example shows the positioning of some of these properties in a RadHubTile.